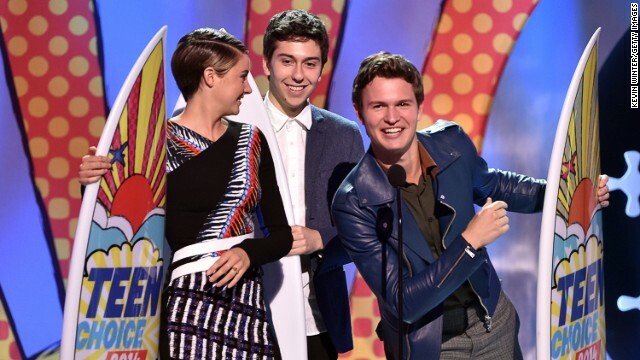 Shailene Woodley, Nat Wolff and Ansel Elgort won the Teen Choice Award for movie chemistry with "The Fault In Our Stars." On TV, big winners were the Kardashians, "Pretty Little Liars" and "The Vampire Diaries"
(CNN) -- Sunday's Teen Choice Awards found no fault with "The Fault In Our Stars." The June movie release was a big winner at the 2014 ceremony, beating out "American Hustle," "Heaven Is For Real," "Million Dollar Arm" and "Veronica Mars" for the choice movie drama surfboard trophy. "Fault" stars Shailene Woodley and Ansel Elgort also walked away with a huge surfboard haul, winning the Teen Choice Awards for movie drama actress (Woodley), movie drama actor (Elgort), and for movie liplock. Their co-star Nat Wolff got a surfboard of his own for choice movie scene-stealer, and he shared yet another surfboard with Woodley and Elgort for choice movie chemistry. "Hunger Games" actor Donald Sutherland won the Teen Choice Award for best movie villain, and he arrived on stage to show exactly why. "You voted me most villainous?" Sutherland, who plays the calculating President Snow in the "Hunger Games" series, asked the roaring crowd. "I've been married for 42 years. My wife asked me to tell you that she agreed with you. I, on the other hand, do not. I think, on the contrary, that I am very nice. Sweet-tempered, and generous." So generous, Sutherland continued, that he'd even brought the crowd "souvenirs" from the "Hunger Games'" Panem. And with that, he opened a bag to toss out berries at the audience -- which in the "Hunger Games" world tend to be poisonous -- with the warning, "I wouldn't eat them if I were you." When Selena Gomez accepted her surfboard for the ultimate choice award -- a top prize that in the past has gone out to stars like Justin Timberlake, Sarah Michelle Gellar and Britney Spears -- she surprised the audience with an unexpectedly emotional speech. "I have to be honest, especially this month, I have to thank you guys, because you remind me -- amidst the stuff that we deal with personally -- you remind me of what's important," Gomez said to her fans. "And that's giving, and loving and caring about each other. I'm not trying to preach ... it's just that you guys make me better." There was one more thing, Gomez continued: "I want to thank my mom so much, because she's the greatest human being in the world," Gomez said. "She's strong, and she's given up her life for me, and she's so beautiful. I want all of you to love your mom and give her everything, because she's incredible." On top of the other honors 20-year-old Elgort won on Sunday, the actor also snagged the choice movie breakout star surfboard. "The Fault In Our Stars," adapted from John Green's novel about a pair of teen cancer patients who fall in love, is just Elgort's third credited movie role, following 2014's other hit, "Divergent." If you don't know the actor's name yet, the Teen Choice Awards is telling you to get used to it. With E! 's "Keeping Up with the Kardashians" now in its ninth season, you might assume that teens in 2014 would be more interested in watching the newest Vine star than the Kardashian family's escapades. But in reality, they're watching both. On Sunday, Kim Kardashian joined her younger sisters Kendall and Kylie Jenner to accept the surfboard for choice reality show, trumping "Total Divas," "The Real Husbands of Hollywood," "Dance Moms" and "Cosmos: A Spacetime Odyssey." You might think after looking at the movie winners that "The Fault In Our Stars" has replaced franchises like "Divergent" and "The Hunger Games" in the hearts of teens, but those two movies were able to land a few wins, as well. "Divergent," which also stars "Fault" actress Shailene Woodley, picked up the choice action movie title, while Woodley was named choice action movie actress as well. "The Hunger Games: Catching Fire," the second movie in the four-film "Hunger Games" franchise, won the choice sci-fi/fantasy movie category and snagged a surfboard for star Jennifer Lawrence, who was named choice sci-fi/fantasy movie actress.